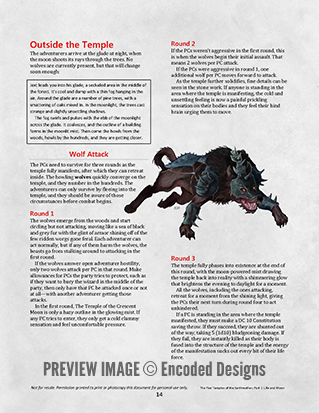 The Five Temples of the Earthmother is a series of short adventures for Dungeons and Dragons 5th edition. Broken into chapters, which take place on the Island of Alaron in the Moonshae Isles of the Forgotten Realms, each chapter in the series details a different adventure site. Each site is a lost temple dedicated to the Earthmother, the force representing the primal essence of nature and life, a revered force in the Moonshaes. 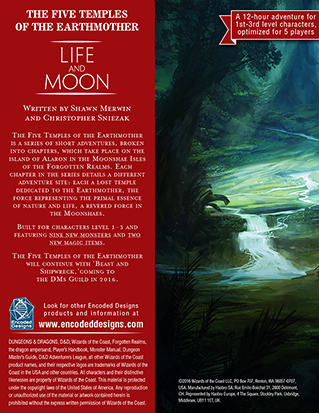 Life and Moon is the first in The Five Temples of the Earthmother series and will continue with 'Beast And Shipwreck,' also from Encoded Designs (date not set). So my players are nearly at the end of this one, any news on a release date for the second one? Through a little research I'm a little concerned that this second module will never come out. There are several forums on it and even a small web article about how part two was supposed to come out back in 2016. Is there really no additional part coming out for this great adventure? Hey I am running this campaign for my players and they are severely enjoying it. Its a great deal of world building and challenge. I do however need the second part of this adventure and was wondering when that was going to be released? 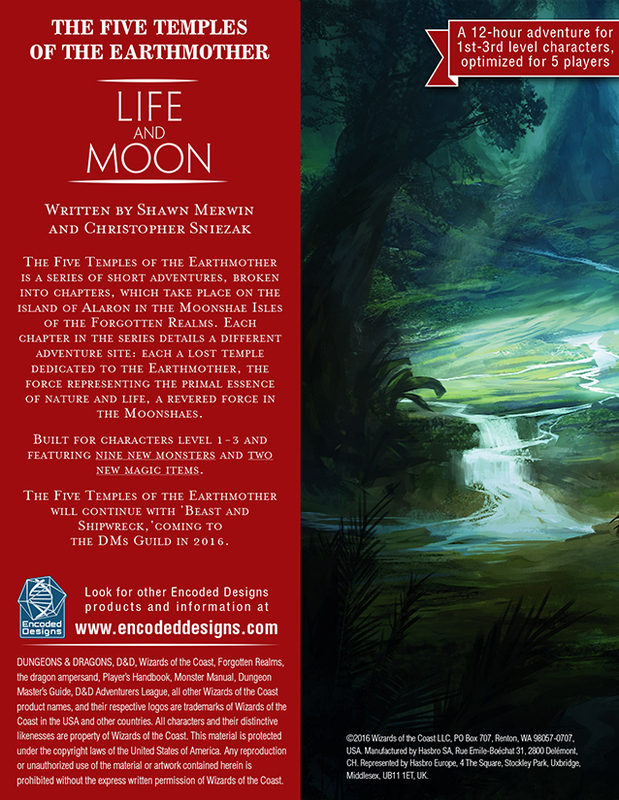 For those who have been asking about updates, I should have more information about this adventure, potential followups, and a Moonshae Isles Campaign Guide in a couple of weeks. I will post here and elsewhere when I get the all-clear to make the announcements. Thanks for your patience! That would be wonderful, I have been waiting anxiously for those for some time. Just heard this getting discussed in your Origins panel, so understand why it hasn't happened yet, but I really look forward to it actually coming to fruition. So it's been months since the last update (promised weeks), and it took you two years to take down the text 'Beast and Shipwreck coming in the second half of 2016'. The lack of basic communication by members of a professional development team, to people who have spent money on your module, and have been looking for updates on a 2nd and 3rd part for literally, years, is frankly incomprehensible and inexcusable. Picture this: take a person looking to run a Moonshae campaign. They are a busy person and is looking to run a real campaign for the first time. They want to start with some guidance and cool maps. 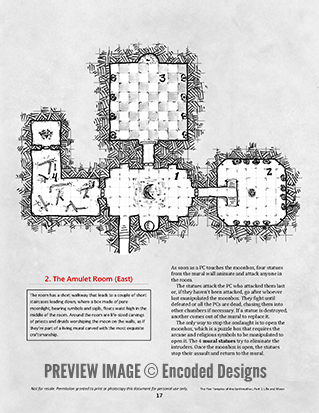 The DM buys a module with the promise of more content coming in ~6 months. He then read through the module it and likes it, so they go in with the understanding that these things take time and that time estimates by developers are sketchy at best. That person says, 'Cool I can milk this and add in some of my own ideas, a boat-load of random encounters, and maybe some side-quests for about 6-10 sessions'...See more (8 months to a year, for a monthly group). That DM is me; those players: mine. Shawn was hoping you could provide an update in regards to the release of Part 2 and the Moonshae Player's guide. Last update I see is over 6 months ago. We alle had great fun with this adventure and I hooked into a greater campaign. Still really hoping for part two to be released or re-released so we can revisit this part of the adventure and complete the consecration of all five temples. Bought and played this back in March of 2016... came to see if part two was ever released, turns out it wasn't. Description for this product still states that part 2 will be released in 2016. Is there an ETA on the part 2, or is this dead in the water? The authors just talked about this on the most recent episode of their Down with D&D podcast and confirmed that they will finish the Moonshae Player’s Guide and the next Moonshae adventure “Temple of the Beast. No date was given yet. My players really loved the Temple of the Crescent Moon. Any update on when part 2 will be available? Section 4. The colony (pp. 11 and 12) has a Hive Warrior stats and hasn't a Hive Worker stats. Sorry, stats are in their places. But Hive Worker is misprint as Hive Warrior. So, I've purchased and am about to run this module. Figure it will take 2 sessions to complete. Any idea when the next module or modules will be published? I may find myself making up the next couple temples myself otherwise. We are currently working on some player content for Moonshae-based characters. That is in development and playtest currently. When that is completed, the next adventure should follow soon after. Thanks! Just purchased, and looking forward to running it in the near future, as it looks great, but any ETA on the above mentioned Player Content? That will determine if I volunteer to run next for our group, as I would love to build a whole campaign set in the Moonshae's, and that information would be great to have before beginning it. So I read through the adventure and it looks great, I'm gonna run it for some friends soon. One thing is really strange to me though, at the beginning it says you should give the players one or more of the rumours, but none of the rumours ever come up in the rest of the adventure. I don't know if maybe they're gonna come up in the next adventure, but I'm kinda worried that if I start by saying "There's a Great Druid who disappeared" or "The king's Son has been taken", it's gonna be kinda weird when the King is only interested in them helping with the temples. This is well worth the purchase price. Great Module! I've been running a Moonsea campaign and this really captured the Celtic heritage/feel of that part of the realms... My only question... How do you pronounce "Failbhe"? Is this legal for Adventurer's League Play? No. Only adventures with the D&D Adventurers League logo will be legal for play. Just read through the module after I bought it. It's 21 pages long and sort of follows the same format the starter kit did. 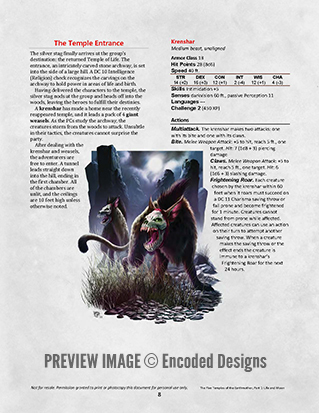 It doesn't include monster blocks except for new monsters, otherwise it will bold the monster name and you pull the stats from the Monsters Manual. It has some decent maps and artwork, the story is interesting in fun. Not the best module I have ever read but definitely looks fun. I'll post after we start the game to see what the party things of the module. Just a followup that this module starts off a bit slow, typical 1st level stuff. My party really started to enjoy themselves once they reached the temples and Shawn did a great job at making these experiences and fights interesting and fresh for lower levels. I wish it had more RP setup and hooks for the Moonshae Region but overall would give this module an 8/10. Shawn my players were asking me when we can expect the Part 2 of this series. I read a tweet somewhere that not too far away does that mean within the next 6 months? Thanks for the good module! Thanks for the kind words. We have an outline for the next adventure, but first we wanted to create some player content (new races, classes, etc.) that fit within a Moonshae campaign. When that is done, the adventure will not be far behind, but it is taking some time because of other deadlines.